When Tash was a child, she had an imaginary friend and another friend that went missing. At the time, Tash was sure that the two were linked. She did the right thing; she told police that she saw Sparrow lure young Mallory away. The problem was, no one else could see Sparrow. What followed after was Mallory being found unharmed but unable to recall what happened and a nearly a decade of therapy for Tash. Mallory moved away and Tash continued to be disbelieved and untrusted by those closest to her. Now Mallory has moved back. And Sparrow starts to once again haunting Tash. Can Tash ever find out what really happened? Will Mallory remember something that links Tash to her disappearance? Is Tash once again falling into delusions she had as a child? Tash remembers when Sparrow first appeared. It was at Willow Creek, a family property, while staying with her Aunty. But Sparrow wasn’t your normal childhood imaginary friend. At first he wanted to play, then things turned sinister. Sparrow became sinister (in a non-sexual way) and started to try to hurt and scare Mallory, and it was for this very reason that Tash watched as Sparrow lured Mallory away – Tash knew Sparrow was looking for her. Since the day of telling the police that she saw Sparrow lure Mallory away at the carnival, Tash has endured years of isolation, therapy and even being untrusted by her own mother. Tash’s psychiatrist determined that Sparrow was a fabrication made by Tash to deal with her feelings of loneliness. But instead of imagining some nice young friend to play with her, Tash had Sparrow; a horrible, taunting and scary boy who was fabricated to gain the attention that Tash so desperately wanted. Tash is certainly an unreliable protagonist. But in the years since Mallory’s disappearance, return and moving away, Tash has regularly visited her psychiatrist and is trying to start a fresh life filled with trust, responsibility, ease… and certainly no more Sparrow. But then Mallory returns to town. And all of Tash’s uncertainties around Mallory’s disappearance and Sparrows involvement return. Since her disappearance, Mallory has not, and cannot, speak about her ordeal. However Tash feels that Mallory is the key to finding out what really happened. And when Sparrow starts reappearing to Tash, she is determined to find out what exactly happened, and what Tash’s involvement was. Did Tash hurt Mallory? Is she far more dangerous than she wants to believe? The strength of this story is in which it was told. There are so many ways this story could go, and Sarah Epstein touches on them all. You flick between thinking the truth is one thing, then another, then another – did Tash have an imaginary friend or is she really mentally/psychologically disturbed? Were certain people involved in Mallory’s disappearance? Is Sparrows returning a figment of Tash’s imagination or a cruel joke? I loved the way in which the story was delivered; past tense via memories and transcripts from psychiatric sessions, as well as current tense. It was a fantastic way to unravel past happenings and beliefs, as well as seeing the current events and revelations that may endorse or dismiss past truths and theories. I have to say, my favourite part does have to be seeing Sparrow through the eyes of childhood Tash. Sparrow is creepy as hell!!! Seeing him through the innocent eyes of a child, but reading it as an adult is super disturbing. I don’t know why, but I wasn’t expecting so sinister in Tash’s imaginary friend – maybe that made it all the more disconcerting for me. All this left me was thinking thank god I didn’t have an imaginary friend as a child! The truth behind it all – which I will not go into so I do not spoil the story – is messed up. On so many levels, it was so messed up! There are a few elements to the conclusion that make story all the more scary. 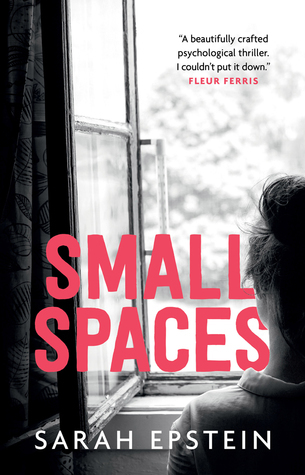 Small Spaces is a fantastic Aussie debut that will be sure to have you on the edge of you seat, and just slightly more than a little freaked out. Note: This book is so far only published in Australia. For those of you who are over a pond, do not despair – you can get this from The Book Depository (free shipping worldwide as long as they deliver to your country). Get some Aussie YA on your shelves – you will not be disappointed! Link above.